The tagline on the Moon site is “The Minoan world comes alive through seasonal rituals and rites of passage, honoring Ariadne and her Labyrinth.” This immediately resonates with me as (as you may know) I am fascinated with the impact ancient culture has on modern people, in ways both large and small. From the outset I am thrilled by the passion Laura shows for her subject. Clearly the Minoans have inspired her from an early age, and it’s wonderful to see that fascination nurtured and blooming into the magical relationship she describes. Crete comes alive for me; Laura’s description of the island belies the fact that all this information comes from research rather than first-hand experience. Laura covers all the pertinent studies relating to the Minoans and while presenting all the possible facts, is keen to stress the most likely ones as her picture of how the Minoans lived and the key points in their society. This is an intelligent and open minded approach which sits well with me. As does the focus on the everyday Minoan and not just the priest/priestess; after all, ultimately we are the ‘common folk’, so reaching back through time we may find more links to our ancestors by focusing on everyday life: the mundane as well as the magical. The magical though does play a huge part in this book. We hear about the Minoan pantheon; some are familiar but certainly for me, there is a great deal to learn and Laura keeps me turning the pages to do just that. I was astonished at the range of gods and goddesses included here! There are also the meanings of symbols, animals and how Minoan ceremony works within the Wheel of the Year. In the ritual work section, she is careful to explain the whys and wherefores of using certain symbols or not; the approach is inclusive with a hefty dose of common sense. Rarely have I read a book that goes into so much detail about the spirituality and mythology surrounding one particular culture. The explanations of the symbolism of the Labyrinth are surprising and enlightening. Laura also looks at the similarities and differences between Ariadne and her ‘equivalents’ in other cultures, including mainstream religion. This book is truly comprehensive but what is more impressive is that it’s also fascinating and entertaining. If you are interested in ancient culture at all, you will adore this. If not, you would still get a kick out of the beautiful descriptive paragraphs and analytical style. 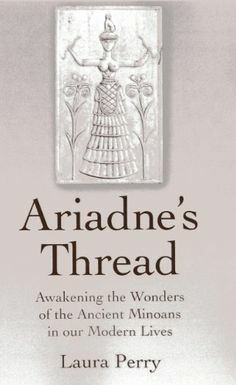 Ariadne’s Thread is a permanent addition to my ‘regular reads’ library and a triumph in what I consider the most necessary task of Pagan books: making it relevant. The thread Laura spins weaves all the way through time and is never broken. We can follow it either way, each page a new spool to turn.